Segmented, linear, ssRNA(+) genome. The three segments are 6, 3.5 and 3 kb in size respectively. The genomic RNAs are capped, and display a tRNA-like structure in 3'. The virion RNA is infectious and serves as both the genome and viral messenger RNA. 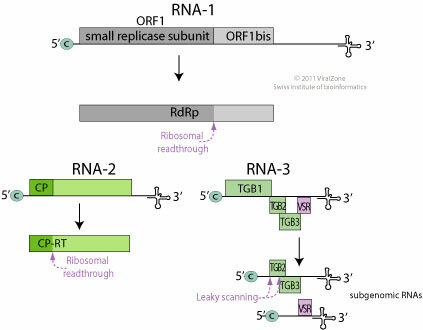 The RNA-1 5'-proximal ORFs are directly translated to produce the viral constituents of the replicase complex. RdRp is translated through suppression of termination at the end of ORF1. Suppression of termination in RNA-2 produces an extended capsid protein. Subgenomic RNAs may be synthesized during replication of RNA-3. TGB1, TGB2 and TGB3 function as movement proteins. TGB2 and TGB3 are produced by leaky scanning. ASSOCIATED DISEASES Dwarfing of shoots (mop-top). Potato spraing disease. TRANSMISSION Vector: fungus (Spongospora subterranea).